Mr. Mohamad Ghani Hikmat (1929 - September 2011) is a renowned sculptor, specialized in bronze casting, whose works demonstrate individual excellence. His sculptures are landmarks in his native Iraq, Europe, and the Middle East. Mohamad Ghani Hikmat’s art encapsulates Iraqi culture: Sumerian, Babylonian, Assyrian, and Abbasid. He draws his inspiration from the imagery and poetry of his country, from the famed 14th Century 1001 Nights, including Sindbad the Sailor, Kahramaneh inspired by Ali Baba and the 40 thieves and two Flying Carpets. Today, through his art, he is striving to make his broken city, Baghdad, beautiful again. He was commissioned to do four new public sculptures by Baghdad’s municipality. One of them a fountain based on bronze calligraphy from a classical inscription from the tomb of Mustapha Jamal al-Din. An artist of 60 years of experience, Mohamad Ghani Hikmat was a pioneer of the outstanding contemporary Iraqi art movements, the Baghdad Group for Modern Art and Al Zawiya Group. Through his work, he has raised the awareness in society of the nature and importance of cultural authenticity and artistic identity, yet he has suffered the loss of hundreds of pieces from his life’s work, looted or broken during recent years of fighting in Baghdad. Mohamad Ghani Hikmat graduated from the Institute of Baghdad and the Academy of Rome. For over 50 years he has held one-man shows in Rome, London, Beirut, and Baghdad. He has taught generations of Iraqi students. 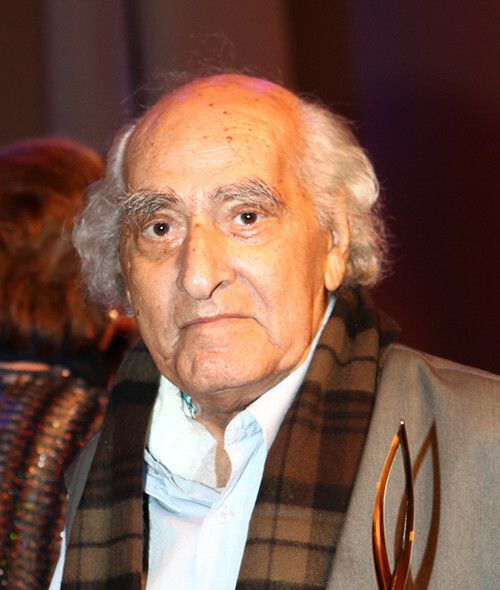 Mohamad Ghani Hikmat passed away a few months after receiving the TAKREEM Award.